Do you ever get bored of the dishes you make night after night? I know I do. Even though I cook a lot, I still tend to repeat the dishes my family gravitates to until they get boring. So tonight I decided on stir-fry, a dish I blogged about back in 2010, but thought I’d share it again. 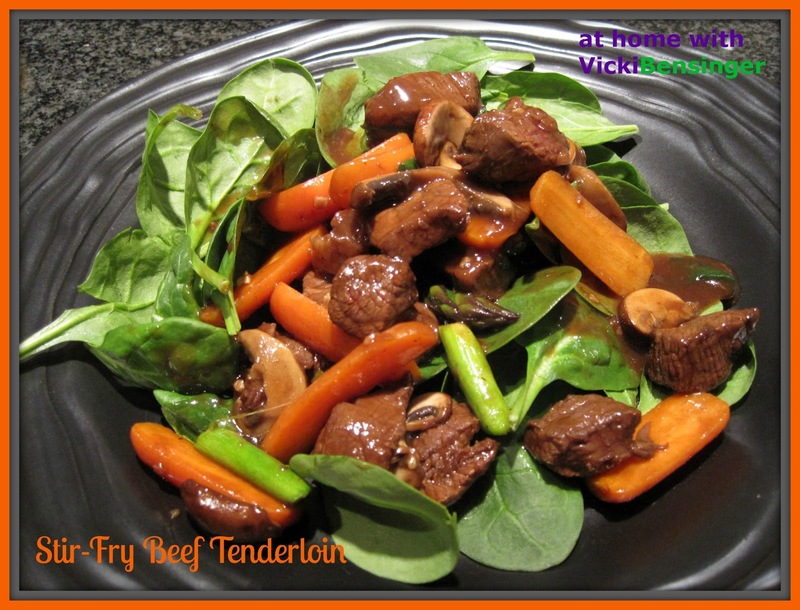 When I make stir-fry I serve it on top of brown rice, raw spinach or some variety of lettuce. Tonight I felt like a plate of veggies so I served it on top of raw spinach. I’m sure this would taste delicious and be healthy over barley, quinoa or any other grain you like – be creative! The key when making stir-fry is to mise en place your ingredients, so they’re ready when it’s time to toss into your wok. Since stir-frying is a quick process, this alleviates any mistakes, and overcooking. Be sure your flame is high, and use an oil with a high smoke point such as canola, peanut or grapeseed oil. If possible use a heavy flat bottom wok, allowing a larger surface area to come in contact with the heat, rather than a round-bottom wok. Stir-fry can be made with beef, chicken, fish or all vegetables, even tofu. 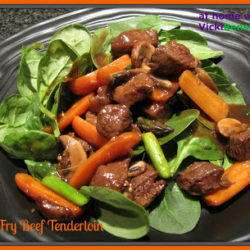 However, this evening I purchased beef tenderloin and used veggies I had on hand to add to the mix. If you’re not a fan of the veggies I selected, use those that appeal to you and your family. Leftovers can be warmed up the next day and wrapped into a tortilla, adding spinach, or your favorite grain, making for a delicious and hearty lunch. Note: Before preparing this dish be sure to read the directions at least two times, familiarizing yourself with each step. This dish is simple to prepare. Mise en Place is key! Mise en Place: Cut beef into 1/4 inch rectangular slices about 1/2 inch wide and 1 inch long. In a bowl combine the soy sauce, 1 tablespoon of rice wine, and sesame oil. Blend well and set aside to marinate for at least 15 minutes but no longer than 8 hours, refrigerated. Set aside the remaining 1/4 cup of rice wine. Trim stems off mushrooms and slice into 1/4 inch pieces. Cut green onion on a diagonal into 1-inch long pieces. Cut the same with the asparagus. Slice baby carrots in half lengthwise. Combine all veggies together on a plate and set aside. Combine the seasonings if using both and set aside until ready to use. In a separate bowl combine the sauce ingredients and set aside. Cooking Instructions: Place the wok over the highest heat. When the wok becomes very hot, add 2 tablespoons of the cooking oil. Roll the oil around the wok and when the oil starts to smoke, add the beef. Stir and toss the beef until it loses its raw exterior color, about 2 minutes. Then slide beef onto a plate and set aside. Immediately return the wok to the highest heat. Add the remaining 1 tablespoon of cooking oil, and the Seasonings. Stir-fry the Seasonings for about 5 seconds, then add vegetables until they brighten in color. This should only take about 3 minutes. Just after adding the veggies add the 1/4 cup of rice wine, this will help the veggies to soften more quickly giving them a richer flavor and stir. Stir the Sauce, and then pour it into the wok. Return the beef to the wok. Stir and toss until all the ingredients are glazed with the sauce and thickened. Transfer stir-fry immediately to a serving platter. Place on top of spinach, lettuce or grains.